This gorgeous strapless cami is made from 100% silk chiffon. The chiffon has a slight crinkle which gives a fantastic look to this garment. The side front is embellished with a stunning floral applique. The flowers are laser cut with laser cut detail. Embroidered to the applique with silver and ivory threads. The applique is then decorated with mirror sequins, clear beads, straw beads and pearls. This gorgeous strapless cami is made from 100% silk chiffon. The chiffon has a slight crinkle which gives a fantastic look to this garment. The side front is embellished with a stunning floral applique. The flowers are laser cut with laser cut detail. Embroidered to the applique with silver and ivory threads. The applique is then decorated with mirror sequins, clear beads, straw beads and pearls. 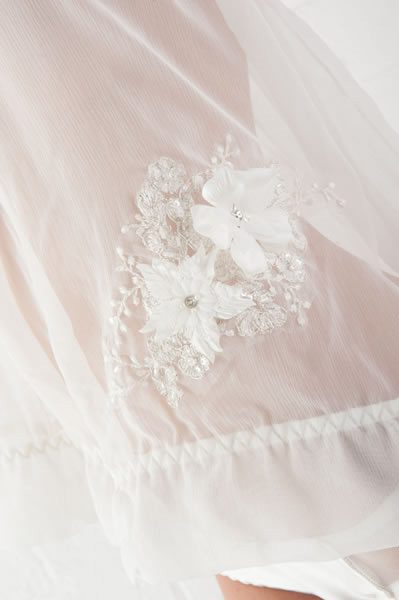 Making this a truly special piece to have as part of your wedding lingerie. It is perfect to wear when getting ready as it wont cause any straplines. The alluring quality of the fabric also makes it the perfect lingerie to wear on the wedding night and honeymoon.